Alaskan politics has always been a little special. A little out of the ordinary. Alaskan Republicans like their dinner with a side of socialism, and Democrats enjoy their Second Amendment rights almost as much as they love the thought of drilling in ANWR. Of course, there are plenty of those who fall on the outside of this dichotomous assumption. The individuals who display “Joe was right” stickers, or others, like my friends in the Good Daze band, who hold rallies in support of renewable energy. There is a place in Alaska for everyone. From the most liberal of bloggers to the most conservative of militia members. Citizen soldiers. Japan has been a nation of warrior-farmers; individuals as likely to pick up the plowshares as the rifle. The same is true of Alaska where the homestead and the hunter have often gone hand-in-hand. The earliest migration to Alaska after the Gold Rush was of displaced Midwestern farmers during the Great Depression. For Japan (up until the Sword Collection Edict of Toyotomi Hideyoshi in the late 16th Century), any farmer could be a warrior. All it took to make a warrior was a sword. Homegrown spirituality. Local religious practices often win out over foreign dogmatism. While Japan battled with and/or assimilated various aspects of Confucianism, Buddhism, and Christianity into its own spirituality (a sort of Buddhist-Shinto hybrid), the same is true of Alaska. A 2009 Gallup Poll showed Alaska to be the 5th most irreligious state in the country. You will always find enclaves of the extremely religious (for example: North Pole and Mt. Hiei), but the majority of the population is incredibly anti-religious, or at best believes in a sort of “religion of the masses” (see: Pure Land Buddhism). Isolated, yet hungry. Japan, like Alaska, is isolated. While both have thrived economically, each has had to rely on the importation of goods (at one point or another) in order to expand and survive. For Japan it has been guns, lead, sugar and gold. For Alaska, it has been fruits, textiles, and the majority of our manufactured goods. Japan, I will confess, has long been the more sustainable of the two. Where is Alaska’s own Nikon, Subaru, or Kawasaki? We have what little oil remains under the North Slope. But what will become of Alaska when the pipeline runs dry? Divine personalities. Each state, both Japan and Alaska, has its own “divine” political body. For Japan, it has long been the Imperial family. For Alaska, the names Begich, Murkowski, Young and until recently, Stevens, had their own divine nature to them. Alaskans have viewed many of these individuals with great respect, enough to enable one (Don Young) to remain in his Congressional seat for 37 years, and another (Ted Stevens) to retain his for 41 years. Politically fragmented. Despite the long-reign of the Imperial family, Japan has had a fragmented political system. Japan had the Warring States period while Alaska has begun experiencing its “Warring Senate” period. Japan had no centralized authority (the emperor being merely a figure-head) for several centuries. It took the force of several well-resolved individuals to end the unrest and insure stability.Now, Alaska is facing its own period of unrest with the question of “Who will speak for us in the Senate?” being the most prominent. Alaskans are torn between three different candidates. Candidates who have almost split Alaska into political thirds. An anachronistic rephrasing of that question would be “Who will be Alaska’s Tokugawa?” Unlike Japan, Alaska is (hopefully) in the midst of a bloodless transition that will not (I assume) take hundreds of years to accomplish. However, for those who are aware of the recent Drop Zone incident, who knows? Emigration-by-proxy. Japan has had millions of its citizens emigrate to other shores. 15,000 moved to Siam alone during the feudal era, to say nothing of those that later went to Cambodia, the Philippines, Brazil and even the United States. Alaska currently suffers from its own emigration-by-way of a “brain-drain”, with many of its graduates seeking jobs and a better education in other states. Alaska is perfect for northern studies and the sciences, but not much else at the present. What does this mean for Alaska and it’s political structure? In my opinion, Alaska is in need of fresh political blood, term-limits and more then two dominant parties. Some of you, who’ve read my earlier blog on Lisa Murkowski’s write-in campaign know how I feel: it’s a terrible idea. But, what isn’t so bad about her running is that it proves a third-party candidate is viable. It’s been a long time since someone other then a party Democrat or Republican has done so well in an election. Or at least in the run up to an election. Alaska needs an Alaskan candidate who actually gets the state. At the risk of sounding like an Alaskan Exceptionalist, this state is unique and needs an equally unique individual to help ensure it’s survival and hopeful prosperity. 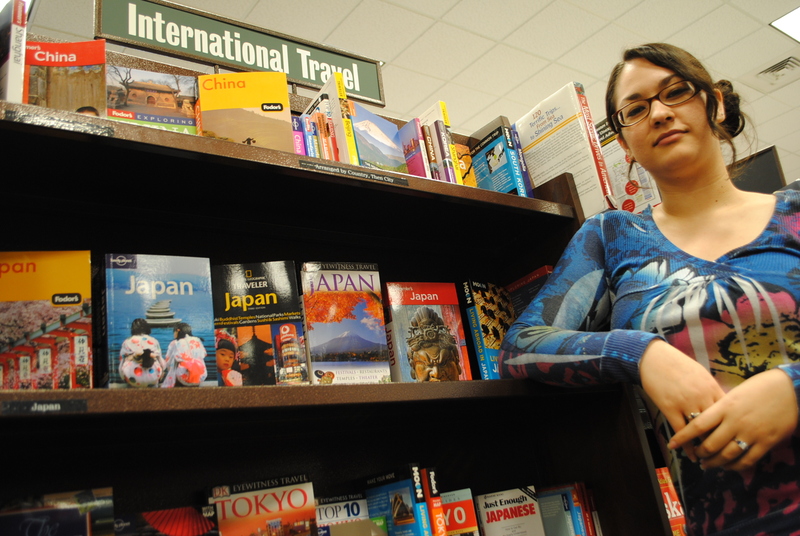 Rauchelle King poses for a picture in the International Travel section at the local Barnes and Noble last week. Photo by Jeremia Schrock. Japanese and Business student Rauchelle King is about to become Mrs. International. No, she isn’t set to wed the world (although she is married), instead she’s about to hitch her wagons and head west to Japan. Why Japan? “Well, I’m going because I’ve always wanted to…and it’s a degree requirement,” the excited (and pragmatic) King said in a recent interview. King will be heading to Nagoya Gakuin University, a private college, in Nagoya City, Aichi Prefecture, Japan in order to accomplish more proficiency with the Japanese language. “It (Japanese) is really hard,” she said. “The best way to learn a language is to be immersed in it.” According to UAF professor David Henry, the average third year student “should be able to converse, more or less” with a native Japanese speaker. While King’s main goal is language proficiency, she also hopes to help her new Japanese friends better understand American culture. “All they see (of America) is TV and movies,” she said, adding that those from Japan that she has spoken to often have a skewed view of Americans. However, according to Henry, every Japanese student since 1945 had taken at least six years of English. Generally, American English. “They know more about the states then most (Americans) do,” Henry added. Ultimately, King intends to start her own consulting firm which would be geared toward working with Japanese businesses and tourists. “I would like to teach a course about Japanese culture and language to employees of Alaskan business[es] so that they can deal with Japanese people [better],” she wrote in a recent email. “[For now], I’ll probably just try to get a job with Chena Hot Springs or Princess Hotels, helping them with their Japanese tourist side of things,” she added. What’s the worst part about going? Being away from her husband, Josh. “If it wasn’t for him, I’d stay for a year (instead of just one semester).” While she remains enthusiastic about her trip, she is preparing herself for that first day away from Alaska and her beau. “The day (I leave), when my husband drops me off, I’m sure I’ll be bawling my eyes out,” she said. No word on what she’ll tell her new Japanese friends about Sarah Palin, however.